Bo Burnham was the first viral star. At the least, he was the first person to launch a career after gaining his following on a social media platform. Silly songs uploaded to YouTube for his brother away at college turned into wide popularity, which turned into a Comedy Central contract and three stand-up specials in 10 years. His third and newest hour, “Make Happy,” just came out on Netflix June 3, and he calls it “a show about performing.” It’s not like he’s never been direct about the subject before — in his debut special in 2010, he prefaced a song called “Art Is Dead” that condemned himself and attention-seeking entertainers at large by unironically saying, “This song isn’t funny at all, but it helps me sleep at night.” But now his critiques of the entertainment industry and his anxiety about his own career have moved from background to foreground, from subtext to text. There are reviews of “Make Happy” online now, some blow-for-blow. I won’t attempt that here. It’s a great special. It’s as madcap and subversive as Burnham always is. You should watch it. But if nothing else, watch the last 15 minutes. In a year of “Lemonade” and “The Life of Pablo” and the sustained success of “Hamilton,” this will get overlooked, but right now it’s the most important art of 2016. I say that because, at the end of his performance about performers, Burnham holds up a mirror. You are a performer, he says. We all are. Three quarters of the way through “Make Happy,” the 25-year-old writer/comic/philosopher kneels at the edge of the stage and says, “I worried that making a show about performing would be too meta, it wouldn’t be relatable to people that aren’t performers, but what I found is that I don’t think anyone isn’t” a performer. The house lights turn on, forcing fans at the Capitol Theatre in Port Chester, N.Y. onto the same plane as their entertainer, for this is quickly becoming an honest address, not an act. Burnham calls 1990s America a “cult of self-expression,” when children were taught that everyone cares about their opinions, and decries the notion that today’s teens and 20-somethings are naturally self-centered. If this half of the song isn’t brutal honesty, it sure feels like it. Burnham started suffering from pre-show panic attacks in recent years, so I’ll bet on its truth. But his anxiety is just as much about being a performer as it is about doing the performing. That must have been the most satisfying Bo Burnham finale a concertgoer could have. Then, Burnham zags again and provides a surprise epilogue for Netflix. On a scale from one to zero, are you happy? ’Cause you’re on your own from here, so, are you happy? I’m open to suggestions — are you happy? You’re everything you hated — are you happy? ‘Hey look, Ma, I made it’ — are you happy? Burnham plays out the song, then exits the room to greet his girlfriend and dog before credits roll. There’s more to unpack in that double-finale than one essay can accomplish, and my description doesn’t do the work justice. Seriously, watch it. This article will still be here when you’re done. I think everyone will get something different out of “Make Happy,” but to me, what’s most worth examining is what Burnham wanted us to examine — performativity. Approval. Attention. Remember, Burnham didn’t condemn social media or blame its users. He’s not the cranky elder wondering what’s wrong with kids today — he’s the wiser peer who wants to help the people and things he appreciates avoid corruption. Any meme, any Vine trend, even viral challenges wrapped in campaigns for “awareness” are all miniature performances of self, with the simple goal of positive attention. It’s why substance-free internet moments like Damn Daniel and Chewbacca Mom are exalted after one dumb moment and a lot of dumb luck. For these performances and everyone else’s, we are the audience — Burnham’s “performer and audience melded together,” all the time, for no reason. But isn’t the rest of “Make Happy” about Burnham himself? It’s a fair question, but consider the sequence of events. He connects social media, performance and the common man; he confesses that balancing artistic integrity with a satisfied audience is his biggest problem as a performer; and he doubts whether performing makes him happy at all. If you extrapolate the first point to the next two, you yield a warning: Living to satisfy some audience rather than oneself is poisoning. In other moments, Burnham ramps up the arrogance of his part-time stage persona to push his point. He pretends to get shown up by his tech crew, then reminds the audience he conceived the bit and deserves all the credit; he baits the crowd into “wooing” for Kendrick Lamar, then scolds them for showing someone besides Burnham their love. It’s still blunt, but sarcastically so. He’s just very didactic this time, while in his previous specials, “what.” and “Words Words Words,” he was decidedly more subtle. He explains the irony of all the songs of “Make Happy” in a way he never would have five years ago. That might frustrate some folks, and that’s understandable. For Burnham, it’s about deconstructing everything to an obnoxious degree, challenging entertainment while challenging himself to entertain. The final layer of the intricate maze of “Make Happy” is the reality of Burnham’s career arc. The comedian who got his big break from performing on social media is now skeptical of our social media performing habits. Coming from a contemporary, even an Aziz Ansari who also analyzes 21st century culture in his act, the message wouldn’t have that extra weight. After 10 years, the arc is changing. Burnham told the New York Times he plans to focus on other projects and avoid stand-up for a long time. “Make Happy” will be the last we hear his stand-up genius and his sneaky-charming singing voice for the foreseeable future. If he didn’t leave the spotlight, if he churned out another special for 2018, would all of this mean anything? 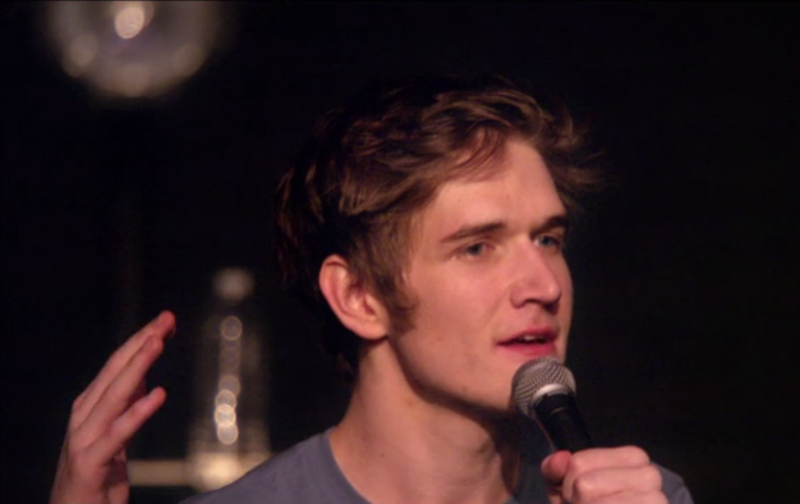 Bo Burnham was the first of too many viral stars. He’s grown up before our eyes. He may be the saddest comedian of our time. So between the critical success of his new special and the message he intended it to send, I hope he’s happy.